From the unpredictable British weather, to family togetherness, delayed trains and Christmas feasts, the eccentricity of a British Christmas is captured through British artist and photographer Juno Calypso’s subverted and unexpected lens in Burberry’s film campaign, entitled ‘Close Your Eyes and Think of Christmas’. 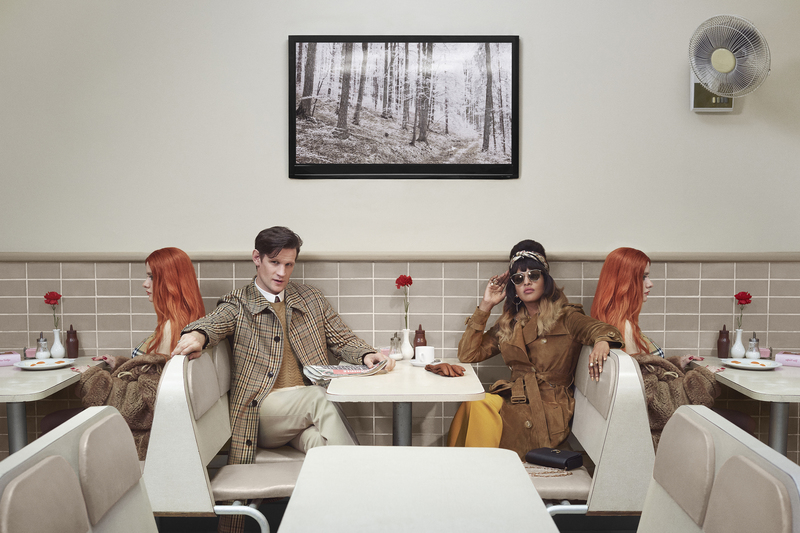 British actor Matt Smith, famed for his roles in hit TV series like Netflix’s The Crown and Doctor Who, returns for another year in exploring celebratory Christmas traditions and rituals, alongside an all-star cast, such as first timers British actress and BAFTA and Olivier awards winner Kristin Scott Thomas, and English rapper and singer/songwriter M.I.A, as well as returning campaign star Naomi Campbell with her mother Valerie Morris-Campbell. “I love Christmas, I’ve always loved Christmas. I love the anticipation, I love the build-up, I love the parties, I love the day,” said Smith, who first appeared in Burberry’s festive campaign last year with actress and singer Cara Delevingne. Read also: Did Riccardo Tisci’s Debut Burberry Collection Live up to the Hype? The campaign is rooted in iconic Burberry pieces for men and women: from the trench coat, car coat, TB Monogram and archive print scarves, to The Belt Bag, tailoring and evening wear for the women. Not to mention, the special treat preview of the new 16-piece Vivienne Westwood and Burberry collaboration, which will launch in stores and online on December 6. Burberry has become renowned for its festive campaigns over the years, featuring star-studded casts like Domhnall Gleeson, Lily James, Sienna Miller and Dominic West (‘The Tale of Thomas Burberry’ in 2016); Sir Elton John, James Corden, Julie Walters, James Bay, Naomi Campbell, Rosie Huntington-Whiteley and Romeo Beckham (‘Celebrating 15 Years of Billy Elliot’ in 2015), who previously appeared in 2014’s ‘From London with Love’.